This side dish is so simple yet so incredibly good. It works really well as a bed for serving pork or fish on. it's bright color makes it a nice side dish for the holidays as well. Saute onion in butter until soft. Add the coriander and salt, then add the cabbage. Saute for 5 minutes or until the cabbage becomes softer. Add a small amount of stock (maybe a quarter cup? ), mostly to keep the cabbage from sticking to the pan as it continues to cook. Cook, uncovered, on medium-low heat for about 20-30 minutes more, adding a little stock when the cabbage needs more moisture. It is done when it is very soft and has cooked down. Remove from heat and stir in the lemon juice or vinegar. I make a similar German "Rotkraut" with apple cider vinegar and a touch of ground cloves. Do you know of a legal balsamic vinegar? Or any tomato products for that matter? And the cabbage looks so good! I'm on a cabbage kick right now. I never even thought I liked cabbage but it's so good!! The SCD legal/illegal list says that real balsamic vinegar is legal, and I've been buying the Napa Valley Naturals brand and they seem to be legal, plus we don't seem to react negatively to it. I can't say for 100% sure that it's fine though. As for tomato products, my family can't have them because they are high histamine, so I don't know, but I've heard people say that the Muir Glen brand works for GAPS people. I use ACV instead of the lemon juice/balsamic. 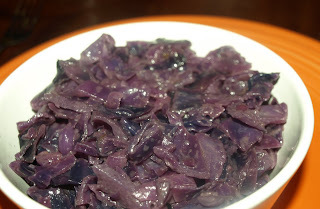 I never even liked cooked cabbage until I made this recipe!! I make it with green cabbage. The ghee and coriander are the things that make it. I was out of ghee and tried it with lard and coconut oil and it was just not the same. So glad to have this recipe!!! http://quietlyrunningtherace.blogspot.com/2011/10/braised-cabbage.html Here is my post about this cabbage recipe.